Worse cognitive function in soccer players stems mainly from frequent ball heading rather than unintentional head impacts due to collisions, researchers at Albert Einstein College of Medicine have found. The findings suggest that efforts to reduce long-term brain injuries may be focusing too narrowly on preventing accidental head collisions. The study published online today in the Frontiers in Neurology. 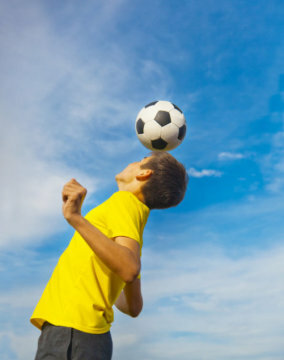 "Unintentional head impacts are generally considered the most common cause of diagnosed concussions in soccer, so it&apos;s understandable that current prevention efforts aim at minimizing those collisions," said study leader, Michael Lipton, M.D., Ph.D., F.A.C.R., professor of radiology and of psychiatry and behavioral sciences at Einstein and medical director of MRI Services at Montefiore. "But intentional head impacts -- that is, soccer ball heading -- are not benign. We showed in a previous study that frequent heading is an underappreciated cause of concussion symptoms. And now we&apos;ve found that heading appears to alter cognitive function as well, at least temporarily." The changes in cognitive function did not cause overt clinical impairment, the Einstein team reported. "However, we&apos;re concerned that subtle, even transient reductions in neuropsychological function from heading could translate to microstructural changes in the brain that then lead to persistently impaired function. We need a much longer-term follow-up study of more soccer players to fully address this question," said Dr. Lipton. In the meantime, soccer players should consider reducing heading during practice and soccer games, Dr. Lipton advises. "Heading is a potential cause of brain injury," he says, "and since it&apos;s under control of the player, its consequences can be prevented."